﻿﻿﻿﻿﻿Sometimes I find my old low-resolution jpg files, with a bit of pixel-pushing in Lightroom and Photoshop, provide good starting points for somewhat artistic renderings. 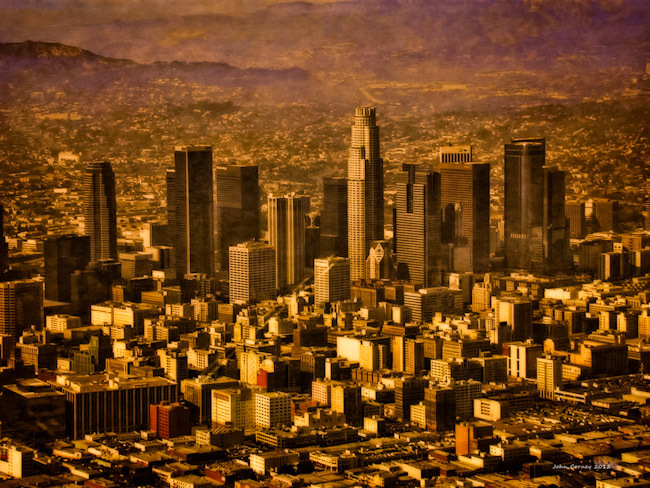 This photo I took from the air above downtown LA back in September 2003 when a friend arranged for us to take a flight over LA with her friend who has a private pilot license. I hope you like this golden view of Los Angeles.